India and Belgium today signed a Social Security Agreement, the first bilateral agreement on social security that India has signed, and will serve as a model for similar agreements with other countries in the European Union. Taking strong exception to Prime Minister Manmohan Singh's assertion on giving religious minorities a "fair share" in government and private jobs, the BJP today said reservation on religious basis would be in contravention of the secular constitutional arrangement. In what appeared to be an overt attempt to polarise votes on religious lines, RJD supremo Lalu Prasad Yadav raked up the issue of the arrest of former BJP president L.K.Advani in 1990. In a unique recovery operation, spanning nearly 100 days, Indian scientists have recovered 98 per cent of the debris of GSLV F-02, the satellite launch rocket that failed its mission on July 10. The Calcutta high court today directed the state government to take adequate measures for the protecting the lives of hundreds of people who had been transfused blood in the last one year supplied from the blood banks after testing through test kits of Monozyme India, a private company which was granted order worth Rs 2.5 crore by the health department. With 31 out of 38 districts of Bihar reportedly in the grip of deadly kala azar (black fever), the World Bank and the Bill and Melinda Gates Foundation are eager to fund the Kala Azar Control and Eradication Programme. The police may be the best bet for Chief Minister Nitish Kumar to establish his promised rule of law in the alleged misgoverned Bihar of the past. But the higher-ups of the Bihar Police are now reportedly worried over the growing trade-unionism in the force, as this might affect discipline and the related desired work culture in the lower ranks of the force. The first meeting of the combined Empowered Steering Group and Executive Committee Members held here today for crystallising ideas to give the police a new outlook. It decided to constitute half-a-dozen sub-committees to have closer study on ways and means to transform the police forces across the country. The Public Private Partnership Appraisal Committee (PPAC) has cleared the construction of six/four-laning of the Delhi-Haryana border up to the Rohtak section of NH-10 and Zirakpur-Parwanoo Section of NH-22. The US Assistant Secretary of State for South and Central Asian Affairs, Mr Richard Boucher, will arrive here on November 16 as head of the US delegation at the Regional Economic Cooperation Conference on Afghanistan being held here from November 18-19. The CBI has started probe on charges of corruption and financial irregularities against Rajya Sabha MP Najma Heptulla during her tenure as Indian Council for Cultural Relations (ICCR) Chairperson. A fire broke out in the auditorium of the Salar Jung Museum this morning, gutting furniture and some carpets. The valuable antiquated exhibits on display at the third biggest museum in the country were said to have been untouched by the flames. Three more persons were found guilty today by the special court set up under the Terrorism and Disruptive Activities Act to hear the 1993 Mumbai serial blasts case. Ashraf-Ur-Rehman, Mohamad Yusuf Botomiyan and Shaikh Asif Yusuf were held guilty under the TADA and Arms Act taking the number of those convicted to 61. Tourists throng to see famous camel fair. No let up in dengue cases. 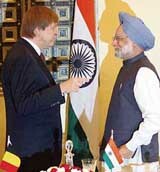 The agreement was signed by Overseas Indian Affairs Minister Vayalar Ravi and Belgian Foreign Minister Karel De Gucht in the presence of Prime Minister Dr Manmohan Singh and the Belgian Prime Minister Guy Verhofstadt here. The Ministry of Overseas Indian Affairs is already negotiating similar agreements with countries like The Netherlands and France. Such agreements would also make Indian companies more competitive since exemption from social security contribution in respect of their employees substantially reduces costs. Those working on a short-term contract of up to sixty months are exempted from social security contributions in the host country provided they continue to make social security payments in their home countries. Those who live and work for periods longer than sixty months and make social security contributions under the host country laws, will be entitled to the export of social security benefits, should they relocate to the home country on completion of their contract or on retirement. These benefits will also be available to employees sent by a company to the host country from a third country. Self-employed Indians in Belgium contributing to the Belgian social security system will be entitled to the export of social security benefits should they choose to relocate to India. With increasing globalisation, rapid growth of the Indian economy, emerging opportunities in the global economy, a large pool of young and technically qualified persons in India and an ageing population in the western world, migration of professionals from India is bound to grow considerably in the foreseeable future. The bilateral social security agreements become an important instrument to protect the interests of Indian professionals by securing exemption from social security contribution in case of short-term contracts and exportability of benefits in case of relocation, given the social security system extant in most countries. There are about 7000 Indians working in Belgium in different sectors. Some are self-employed. The significance of the agreement arises from the fact that the investment by Indian companies in Belgium and the investment by Belgium companies in India has been growing rapidly in recent years. Indian corporates too have a significant presence in Belgium particularly in the diamond trade and the IT sector. The main Opposition party also warned that this "preposterous" proposal is fraught with disastrous consequences for national unity and integration. "BJP is all for fair treatment to not only minorities but to all disadvantaged groups as we believe in smooth progress of the entire population simultaneously," party spokesperson Prakash Javadekar told newspersons here. Charging the Prime Minister of playing minority card ahead of the coming Assembly poll in Uttar Pradesh and other states, Mr Javadekar said, "Minorityism may have given political dividends to the Congres and others but it has affected the Muslims adversely and perpetually." minorityism' was not in the interest of minorities themselves, he said. "Congress will have to answer for the plight of Muslims, as exposed by reports of the Sachar Committee and earlier Dr Gopal Singh Committee today, since the Congress was ruling the country for most of the period and is ruling now," he said. "If Muslims have only 6.4 per cent placements in government jobs, it is the gross failure of these (pseudo secular) parties. The abject failure of the CPM has been exposed in West Bengal, where Muslims have only 4.2 per cent placements despite their 25 per cent share in population," Mr Javadekar said. "They made BJP a 'scarecrow', fuelling the feeling of isolation and a separatist mentality among the minorities to keep them away from the mainstream. When modern education is the key to employment and acquisition of skills to remove poverty, these parties thrust their focus on madarsa education, Urdu and Shariat laws and the result was for everyone to see," Mr Javadekar said. nearly five decades for Congress and three decades for CPM in West Bengal...just 6.4 per cent of the 13 per cent Muslims got employment," he said. On the other hand, Mr Javadekar said the NDA, on its part, provided a special package for the educational improvement of all disadvantaged groups, where there was no discrimination against Muslims.. Asked about the status of Muslims in Gujarat, he said their status in both education and employment was the highest in the country, notwithstanding the media's "diatribes." Lalu was interacting with the media in connection with the Bhagalpur Lok Sabha by-poll slated for November 6. He claimed that in 1990 when he was Chief Minister, he was asked by the present JD-U president Sharad Yadav not to arrest then BJP chief L.K. Advani during his “rath yatra”. Lalu said,"He (Sharad Yadav) telephoned me suggesting not to arrest Advani as it would lead to the collapse of then Central (V.P. Singh) government in which he was a minister. But I told him that we would not allow Advani to spread hatred and disrupt communal harmony”. Incidentally, in 1990 both Lalu Prasad and Sharad Yadav were part of the then united Janata Dal and Chief Minister Nitish Kumar was also associated with them. The raking up of a 16-year-old issue by the Railway Minister was an obvious move to tarnish the JD-U as well as to woo the sizeable Muslim community there. Lalu was reportedly worried over recent moves by the Nitish government to open up old cases of the Bhagalpur riots in 1989, which happened during the tenure of the previous RJD government. Bhagalpur, known as the silk city, was badly hit by communal riots in 1989 when the Congress-led government was in power in the state. Besides, Nitish Kumar also regularised salaries of teachers in all government-aided madrasas. He also distanced himself from the recent controversy over the centenary celebration of Vande Mataram. Mr Advani was arrested in Samastipur district of Bihar in 1990 while on a campaign to press for the construction of Ram temple at Ayodhya in Uttar Pradesh. The arrest had led to the fall of the V.P. Singh government in which the BJP was a coalition partner. Lalu Prasad was lauded for preventing possible communal clashes. During the Assembly elections in the state last year, LJP chief Ram Vilas Paswan and Sharad Yadav had claimed that Advani`s rath was stopped by then Prime Minister V.P.Singh and not Lalu Prasad. Interestingly, in Bhagalpur all were eyeing the Muslim vote bank as their support is expected to decide the final outcome of the by-elections. The number of Muslim voters in Bhagalpur is around 3 lakh while the number of Yadavs is less than 1.5 lakh. The united NDA candidate from Bhagalpur, Shenawaj Hussain, a former Union minister, is challenged by a divided UPA house. While the Congress-led UPA, including the LJP, is supporting CPM`s Subodh Rai, the RJD Chief Lalu Prasad isolated himself from the UPA by fielding Shakuni Chaudhury as his party`s candidate here. An important part, the engine of strap-on S4, believed to be the main reason behind the failure, could not be retrieved. However, the recovery of most of the GSLV F-02 subsystems will help space scientists understand reasons behind what went wrong with the flight that could have catapulted the country into the cash-rich commercial satellite launch market. The debris, including the three strap-on S1, S2 and S3 and debris from strap-on S4, is now with the Indian Space Research Organisation (ISRO) and will provide insight to the high-level committee set up by the ISRO to analyse reasons behind the failure of the mission, Secretary Ministry of Earth Sciences P.S, Goel said here. Incidentally, for India this difficult mission in extreme trying conditions is a landmark of sorts. According to the MoES Secretary the GSLV recovery from the sea is second such attempt in the world, the first one being the recovery of Ariane 5 on June 4, 1996. However, in GSLV’s case the recovery became more difficult due to strong underwater currents, poor visibility and the disturbance of the seabed due to intense fishing activity. The GSLV-F02 carrying the INSAT-4C communication satellite veered from its projected path within a minute of take-off and exploded mid-air scattering debris over an area of 60 sq km in the sea off Sriharikota. The Ministry of Earth Sciences was asked to take up the mission of location and possible recovery of GSLV subsystems by the Department of Space. The recovery mission was undertaken through the National Centre for Antarctica and Ocean Research (NCAOR) and National Institute of Ocean Technology (NIOT). A team was mobilised from Chennai on July 15 to begin sonar surveys based on the four impact predicted points provided by the ISRO. The four points represented the four L40 strap-on engines, one of which was a failure engine that caused the mishap. Debris were recovered after 550 diving operations in which four MoES ships, ORV Sagar Kanya, CRV Sagar Purvi, CRV Sagar Pashchimi and a chartered vessel Admital Boris Petrov, participated. The debris was recovered 6.3 km to 7.5 km away from the coast at a depth of 12 m to 20 m. The parts ended up on the seabed in Bay of Bengal, 7.5 km from the launch pad near the shore. The team could not locate the key part, the engine of strap-on S4 that is believed to have failed in the 200th millisecond after the takeoff. “We couldn’t recover the motor or any of its parts from the sea,” Minister of Earth Sciences Minister Kapil Sibal told a news conference. “Better understanding of the mission failure would have been achieved had the S4 engine been recovered. However, the interest of the ISRO that the S4 engine malfunctioned was corroborated from the physical recovery of S4. We don’t want to give a final conclusion. But maybe the engine did not remain in integral stage after the failure,” Dr Goel said. The division bench headed by Mr chief justice, Sridhar Purkar also ruled that the government should immediately publish the names of those persons who might have been infected with hepatitis and HIV due to the recent blood transfusion. These people should be debarred from donating their blood to any other person at least for one year for stopping further spread of these and other life-risk diseases. The high court also ordered that a detailed report on the test kit scam and the impact of the transfusion of blood to the people after testing through the expiry dated kits should be submitted to the court in 15 days. heard a PIL case filed by Mr Tapash Sengupta, father of a thalassaemia victim in whose blood the HIV was detected recently following transfusion of blood supplied by the blood bank. Mr Sengupta, who is the former president of the Thalassaemia Society of India, suspected that his 18-year old thalassaemia patient son must have been infected with the HIV due to taking of blood, which was tested through spurious test kits. The PIL was filed making the chief minister, Mr Buddhadeb Bhattacharjee, the health minister, Dr Suryakanto Mishra, and the health secretary as the main respondents of the case. Meanwhile, the Congress today took out a procession and held demonstrations in 11 different places of the city, demanding rigorous punishment of the persons involved in the blood test kit scam. They burnt the effigies of the chief minister and the health minister and demanded their resignation. 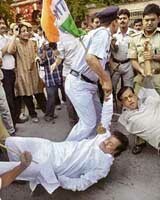 The Congress threatened to give a call for Bangla bandh shortly. Trinamool Congress, separately organised demonstrations on the same issue in several districts in north and south Bengal by making barricades on roads and railway tracks. The state government’s estimate said over 25,000 persons were suffering from kala azar. Former Union Health Minister and senior BJP leader C.P.Thakur, however, claimed that the actual figure was more than the official one. Mr Thakur said that ever since kala azar was first detected in Bihar in 1977, till June this year over 7 lakh people had registered their names in different hospitals and health centres in the state to get treated for this disease. The Union Health Ministry reportedly plans to eradicate kala azar from the country by 2010. It is learnt from the Health Department that about 12 lakh people, mostly poor, across the country are affected by kala azar. A senior official of the state Health Department said that while dengue deaths in Delhi became a national issue, the deaths due to kala azar, which had been regularly reported in rural Bihar, hardly made any news. “The main victims of this disease belong to poor Dalit castes, like Musahars, and other backwards due to their unhygienic living conditions,” he added. Sources in the government disclosed that the Bill Gates Foundation expressed its willingness to join hands with the World Bank to take part in the Kala Azar Control and Eradication Programme in Bihar. A World Bank team was expected to visit the worst kala azar-hit districts of Muzaffarpur and Vaishali in north Bihar shortly to review the situation. Last week, the Vector control programme chief of the Bill Gates Foundation Ket Alteman visited some areas in Jehanabad to make an on-the-spot survey of the situation. Ironically, for over 10 years the blame game over kala azar was going on between the Centre and the state government. Both blamed each other for failure to check the disease. Kala azar, medically known as Visceral leishmaniasis , is a vector-borne disease and is characterised by fever, weight loss, swelling of spleen and liver and anemia that could lead to cardiovascular complications. Sources in the state Home Department disclosed that Chief Minister Nitish Kumar had taken note of the letter written by the Additional Director-General of Police (CID), Anand Shankar, to the DGP Ashish Ranjan Sinha, pointing out to the uncontrolled behaviour of the office-bearers of the Bihar Police Association (BPA). In his letter , which was reportedly handed over to the DGP on Tuesday, Mr Anand Shankar apprehended that “senior police officers would be beaten up by their subordinates inside their chambers if the Bihar Police Association (BPA) and its office-bearers are not reined in”. A copy of the letter was reportedly forwarded to the state Home Secretary Afzal Amanullah also to bring the matter to the notice of the Chief Minister. Mr Anand Shankar expressed his apprehension after he was forced to transfer some constables allegedly under pressure from BPA president Jitendra Narain Singh on September 18. It was learnt that while recommending the dissolution of the BPA, Mr Anand Shankar took strong exception to the way the BPA members raised “petty issues and threatened to create law and order problems if their demands are not conceded”. Mr Anand Shankar reportedly also expressed surprise over the silence of the state police headquarters on an earlier incident in which Mr Jitendra Naraian Singh allegedly misbehaved with a commandant of the Bihar Military Police. In his letter, Mr Anand Shankar further alleged that the association’s members, in particular, never wore police uniforms nor did law and order duty. Mr Shankar reportedly claimed that there were at least 40 such policemen who got paid for no work and such a situation was not good for the health of the force. He also demanded a probe into the assets of the bad cops. On his part, the DGP Ashish Ranjan Sinha reportedly assured a probe into the entire episode. The sub-committees will study and recommend on various issues, including enhancement of skills and competency levels at the grassroots, to meet new challenges such as asymmetric warfare, new trends in urban unrest and disorder, and new forms of social unrest and empowering the police at all levels. The constitution of National Police Mission was mooted by Prime Minister Manmohan Singh on October 6 last year while addressing the annual conference of DGPs/IGPs of States and UTs. The Delhi-Rohtak section, from 29.70 km to 87 km, including the construction of the Bahadurgarh and Rohtak bypasses, under the National Highway Development Programme (NHDP), Phase IIIA, on a build, operate and transfer (BOT) basis. The Zirakpur-Parwanoo section includes the Pinjore-Kalka-Parwanoo bypass under the NHDP Phase III A on a BOT basis. The Delhi-Rohtak section would cost Rs 480 crore and the Zirakpur-Parwanoo section Rs 295 crore. These projects form part of the nine highway projects with an investment of Rs 4,439 crore under the NHDP III A cleared by the PPPAC at its meeting held yesterday. With this, the PPPAC has so far, approved 10 highway projects of the NHAI involving a total investment of more than Rs 5,000 crore and also a port sector project. Mr Boucher is also expected to discuss the Indo-US nuclear deal with Indian officials. The conference will be jointly inaugurated by Prime Minister Manmohan Singh and Afghanistan President Hamid Karzai. It will be the second such gathering of experts to discuss regional cooperation for Afghanistan’s development. The first was held in Kabul. The conference will take up issues like security, energy security, agriculture and economic development. Nineteen countries, including Pakistan, China, Iran, Central Asian nations and those from the G-8 will attend the conference. The CBI has taken up the investigation against Ms Heptulla following directions of the Delhi High Court on a Public Interest Litigation (PIL). The original has the Shah of Iran sitting with the Maulana and Heptualla’s photograph is superimposed on his. CBI sources say that they are led to this case while investigating the corruption in the ICCR involving former Director General Rakesh Kumar. Although the ICCR is understood to have told the government that the issue could be resolved by republishing the book with the correct photograph, the registration of a PE (Preliminary Enquiry), which is the step before an FIR, shows that the CBI has gone ahead with its probe. The book was withdrawn after the disclosure that the photograph was morphed. The fire was noticed around 7 am in the western block and four fire tenders rushed to the museum. The museum has some of the rare and finest exhibits in the world. Officials sought to allay apprehensions of the exhibits being damaged by asserting that only some furniture and carpets have been gutted. Museum officials suspect that electrical short-circuit to be the cause of fire, which was confined to the store and cultural auditorium on the first floor of the museum complex.